Fran is a delicate new tangle from Japanese CZT Shinmi Sato and it’s her first on the site. Shinmi is from Tokyo, Japan. Shinmi’s discovery of Zentangle® came at a devastating time in her life and her story of how it helped her through as well as creating a bond with a brand new best friend is very touching. I discovered Zentangle a few years ago after my son passed away. He took his own life at the age of 17. The grief and despair was just too much to bear for me. I was like a robot with no passion for anything in life. 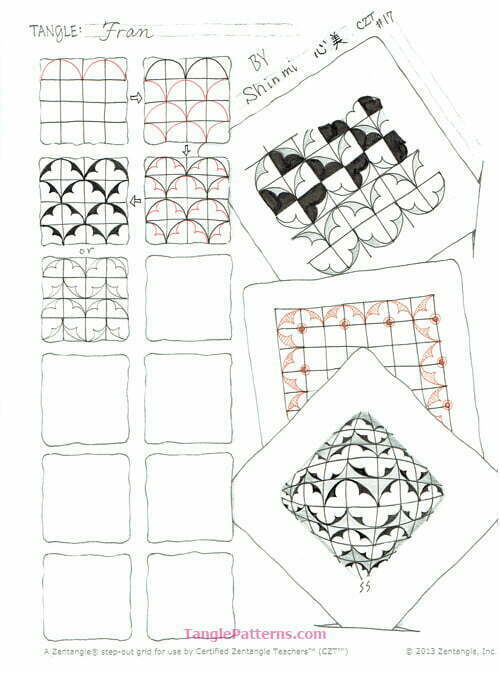 I discovered Zentangle in a bookstore in Tokyo and I decided to go to CZT seminar. Yes, it was so wonderful and beautiful days. It has been like a therapy for my spirit. Francine Huygen from Belgium was my room mate. Zentangle makes a connection between people of different cultures, it speaks to the heart. So I named my first pattern ‘Fran’. Zentangle does indeed “speak to the heart”. Well said. When I was exploring Shinmi’s tangle I tried several different versions. Ultimately I chose the one above for my main example because I liked its light, airy appearance. These are two other bolder versions and as you’ll see from Shinmi’s illustrations Fran is very adaptable to various fills, grid offsets, and shading. Shinmi illustrates the step-by-step instructions for drawing Fran here and in her monotangles she shows several interesting ways to vary it. Check out the tag shinmis for more of Shinmi’s tangles on TanglePatterns.com. What a gorgeous tangle! It is elegant, easy to draw (which removes the “anxiety” of learning a new tangle), and it is very versatile. I came up with three variations on a piece of scratch paper while reading the description. And oh, the shading possibilities! Thank you, Shinmi! I was also at CZT 17. I am so sorry to hear about your son. I can share in your pain, as I faced a similar situation in my own life in September 2014 just prior to our CZT certification. The people at that seminar were so helpful, kind and inspiring. It is amazing how Zentangle can take you from a very dark place to one of light and gratitude. Your tangle is beautiful and I will be trying it shortly. Take care and know you are not walking that path alone. Wonderful tangle. Thank you Shinmi. I too tried out some variations on scratch paper while reading this. Thank you Antonine for that idea. I love this tangle and will be using it very soon! I absolutely love this tangle (and not just because my proper name is Frances)!I love the ‘movement’ of it. It has the appearance of a church window at times. I will love using this pattern. Thank you so much! Thank you, Shinmi, for your beautiful tangle and touching story. Blessings and peace. Shinmi, it is amazing that such beauty can arise from a soul that has suffered so. Thank you for sharing your heart-piercing story as well as this lovely tangle. While I drew it slowly and deliberately into my Tangle-a-Day calendar this afternoon, I sent love to you across the vast Pacific and counted my blessings. Thank you Shinmi for sharing the pain of your loss with us.Fran is a beautiful tangle with endless possibilities. I just cannot wait to try them.Lots of love to you. Long before I discovered Zentangle I was drawing strings (I did not even know that was the name for them) to make a symmetrical design and shading and blending the spaces in between with jewel colours. I can see now that it was the start of my journey towards Zentangles and connecting with so many people across the world. Shinmi, I was so sorry to read about the loss of your son; I am glad that you found Zentangle, though, and thank you so much for this great tangle. I can’t wait to try it out! Thank you for this wonderful tangle. Thank you so much for sharing your story. I lost the man I planned to marry to suicide three years ago. Weekends were the hardest. There were dark days when working on tangles was the only respite. Zentangle has been a tremendous help while trying to live through this never-ending nightmare. Love and blessings from Oklahoma. How lovely. I’ve been going thru a similar grieving season…about my Mom….whose name was…Fran. Thank you. What a lovely honor to Francine. It was odd at Providence – they weren’t sure if you were Belgium or she were Japanese. I consider you both my dear friends. Much love is sent your way. Thank you Shimni for sharing your light and airy tangle with us all. At some time in all our lives many of us have had unbelievable and seemingly unsolvable grief and sadness, but Zentangle “speaks” to our souls and smooths the darkness away. Rest assured we all feel for you, so good and healing vibes are whirling across the world from all directions, just for you. Take care…..
Fran will always be special to me. Our only daughter took her life in July 2013 . Then my beloved husband of 53 years passed away suddenly and unexpectedly in October 2015. I was an only child. Zentangle (self taught) has opened a wonderful and beautiful door for me. Thank you. So many possibilities with this one. Thanks for the share, and hope you and your family are ok after this latest earthquake. This is a beautiful tangle, and so easy. Thank you, Shinmi. Mimi Tolerton, my condolences to you on the loss of your loved ones. I also found Zentangle after my son took his life, and it brought me the most wonderful healing. Keep on tangling! Thanks everyone for all the messages. There are my warm candle in the dark forrest.